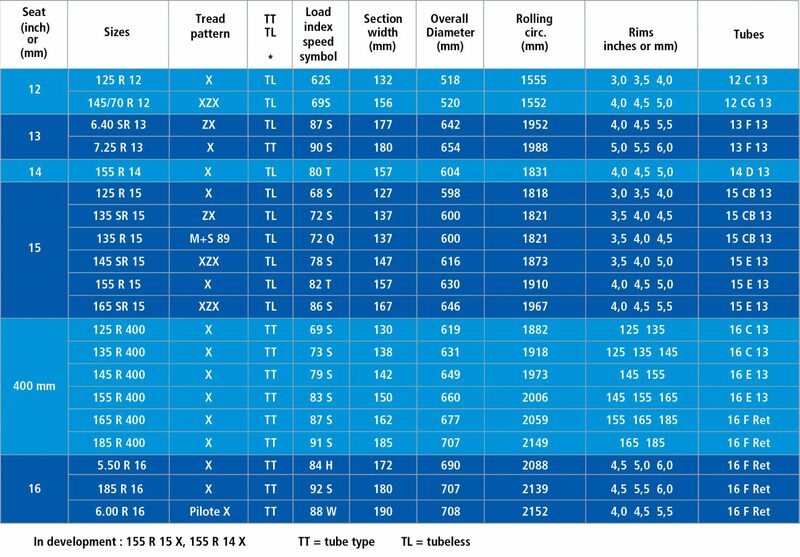 Most of the tyres bear instructions for use such as the load index (number) and the speed symbol (letter). 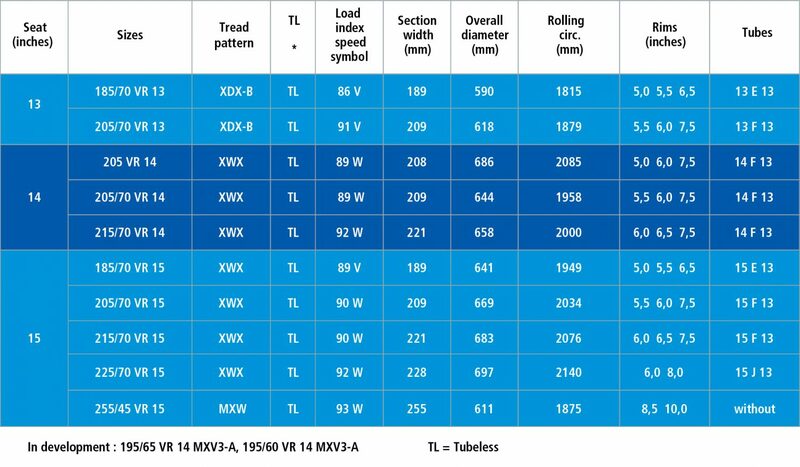 The load index indicates the maximum load per tyre. The speed symbol indicates the maximum authorised speed. Tube type: inner tube separate from tyre. Tubeless: inner tube incorporated into the tyre. Needs an airtight rim. However, on vintage cars, if the rims are not airtight, we can allow the fitting of certain TL tyres with a special inner tube. When this is possible, the corresponding tube is given in the tables. Michelin today offers a range of tyres for classic cars which will fit a number of vehicles made between the Thirties and the end of the Seventies. Michelin’s choice of continuous innovation and technological leadership can be found in this Collection range. These tyres benefit from the progress made in grip on rubber mixings. However, the dynamic characteristics of these tyres remain entirely appropriate in association with those of the vehicles of time. Made in small production runs often by hand, these tyres call on the technical skills and the know-how of the finest craftsmen. The technological excellence of this range goes hand in hand with the historical authenticity of the vehicles. These tyres, reproducing the exact configuration of the model of the time in terms of size, tread pattern and aspect ration thus ensure that the vehicle remains entirely in keeping with the period. In this way, Michelin, by offering you tyres which are both safe and historically accurate, intend to make their contribution to safeguarding, promoting and perpetuating motoring heritage. 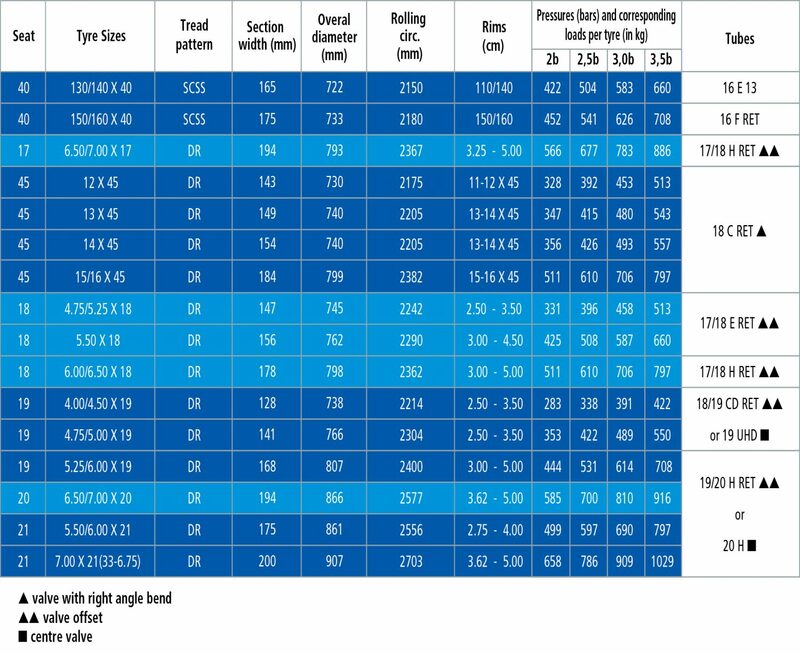 Click here for the full Michelin classic tyre range. And which is therefore a part of our technical and cultural heritage. The introduction of carbon black in 1917 which led to a five-fold increase in tyre service life. The appearance of layers of textile wire cords parallel with each other in the tyre’s carcass, which gave rise to the so-called “cable” tyre in 1919 and the “cable confort” in 1923, the first low pressure car tyre (2.5 bars 36 psi). 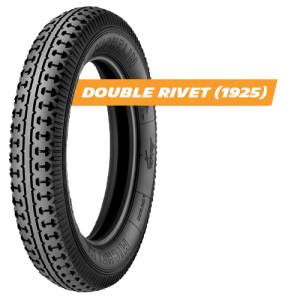 “Double rivet” is in fact the name of a tread pattern which first saw the light of day with the first generation of tyres for motor cars, beaded edge tyres. This tread pattern was retained for first tyres with bead wires in 1925. This tread pattern, with its old-fashioned appearance, was truly revolutionary at the time. It was also the inspiration for the first radial tyres. 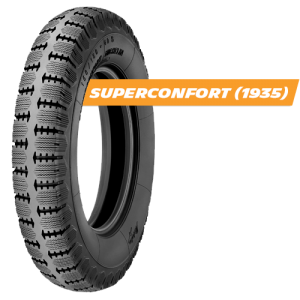 Resulting from research which led to even lower pressures and slower wear, Michelin brought out a very low pressure tyre in 1932, the “Superconfort”. 1935 saw the launch of the “Superconfort Stop S” the first tyre with a heavily siped tread pattern, specially designed for wet surfaces. At the time, Michelin was the only manufacturer who knew how to make this type of tyre with the famous “zigzag” sipes, which greatly improve safety because of the excellent grip they give. As its name suggests, the “Superconfort Stop S” tyre offers exceptional comfort, in addition to its performance on the road. Maximum speed is 150 kph (94 mph). The inflation pressure has to be between 2 and 3.5 bars. To get the best out of your tyres, use the pressure which corresponds to the actual (measured) load on each tyre (fully-loaded vehicle). 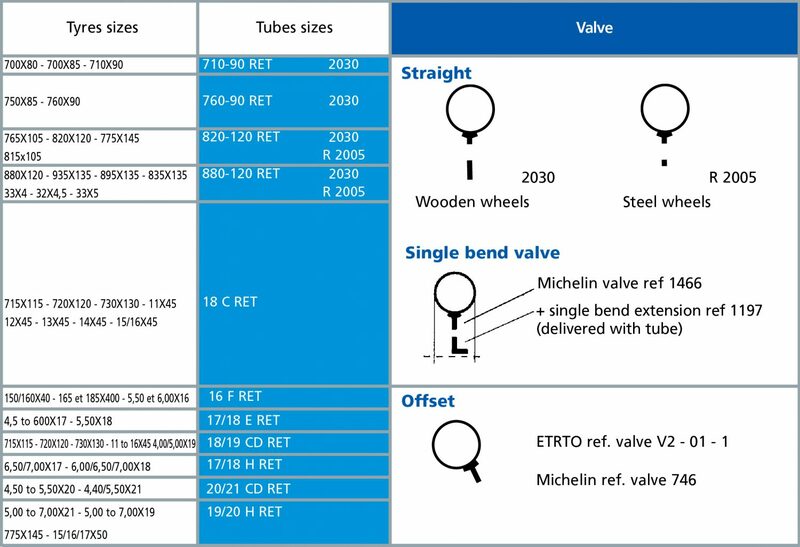 Whenever the vehicle is to be used at speeds or with loads or pressures that are outside the above recommendations, first consult the Michelin technical department by phone or email. With its X tyre with radial casing piles, Michelin set out to conquer the world with a considerable advance in technology. Its revolutionary construction for the time had the special feature of separating the sidewall function from the crown function. The first major innovation from Michelin, the radial tyre was first marketed as the “X” tyre in 1949. At the time, Lancia was the first car manufacturer to fit the X tyre as original equipment on the Aurelia model. From 1955 onwards, radial technology became more popular and the majority of European car manufacturers opted for the radial solution. The X could be fitted to cars of very different categories, from the original and popular 2 CV or Beetle to the fascinating Mercedes 190SL or Facel Vega. Increased comfort thanks to the flexibility of the sidewalls. In the Fifties, the superiority of the X tyre was such that a number of racing drivers adopted it, although Michelin was not officially involved in any racing. Crossply: This cross-section shows the single-concept structure of the cross-ply tyre. 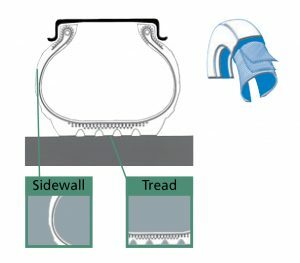 From bead to bead, four layers (at least) of textile fabric extend from one sidewall to the tread, going over to the other sidewall. The sidewalls and tread are not differentiated. The detailed pictures portrays the overlapping cords. These make up a thick mass of innumerable superimposed layers which represent as many areas of friction. A consequence of this is the appearance of “shearing” motions. The longitudinal cross-section show on the bottom left-hand side illustrates the shearing effect between the superimposed layers. 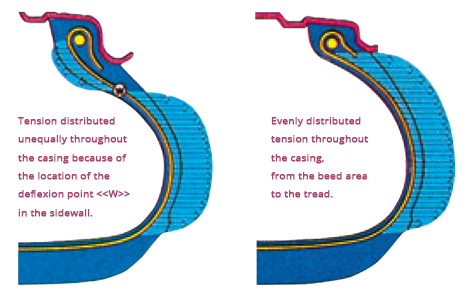 Radial: One can easily see the specialisation of the functions of sidewall/casing and tread. The sidewalls are made up of single layer of textiles plies, and so are not affected by the “shearing” phenomenon. The textile layer, like the rubber layer covering it, is thin and is therefore flexible. The considerable flexibility of the sidewalls results in better handling as well as fuel savings. 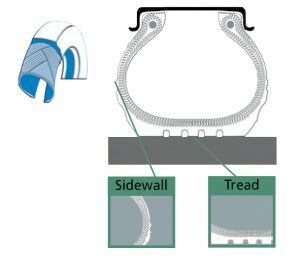 As for the tread, it is made rigid through a triangulation effect brought about by combining the casing layer with two layers of steel cord bracing plies (3 for the X tyre). The rigidity of the crown reduces wear of the tyres an improves road-holding. From its launch in 1965, the XAS remained the reference tyre until the end of the 70s. The first tyre was an asymmetrical tread pattern, the inside and outside of the XAS work differently to give the car a good balance. Michelin made more progress by differentiating the many elements that form the tyre, leading to the creation of the XAS, the first tyre with an asymmetrical tread pattern. The XAS was constructed taking into account the different kinds of work done by the shoulders, sidewalls and different parts of the crown, depending on whether they are on the inside and outside relative to the car. Just like a person’s foot is asymmetrical, the inside and outside of a tyre work differently to give the car good balance and sure handling. Previously unknown level of grip in all conditions. The first production tyre designed to run at 210km/h (131mph), its exceptional performance naturally led to the XAS being used in racing, in Formula France as from 1968, circuit racing, rallies and hill climbs. The Seventies, as motor sport technology evolved so a special tyre was required. For the amateur racer the TB in its intermediate compound form, known as the 15, provided the best compromise between a race tyre and a multi-purpose product. It returns with an additional card up its sleeve: today, the TB range is road legal. We have now added TB 5 F and B 5 R. This uncompromising tyre has a semi slick tread pattern for the ultimate in dry performance. The TB 5 F has a soft compound and the TB 5 R a medium compound. These tyres are fully road legal. Click here for Competition Classic tyres after 1985. The only radial tyre which could be fitted on the fastest cars in the world in the 70’s, the XWX gives these high speed vehicles outstanding road holding and remarkable grip. The special features of the XWX mean that it gives remarkable performance, combining speed, driving pleasure and safety. The original design of its internal construction, together with its flexible carcass give exceptional comfort when travelling at very high speeds. 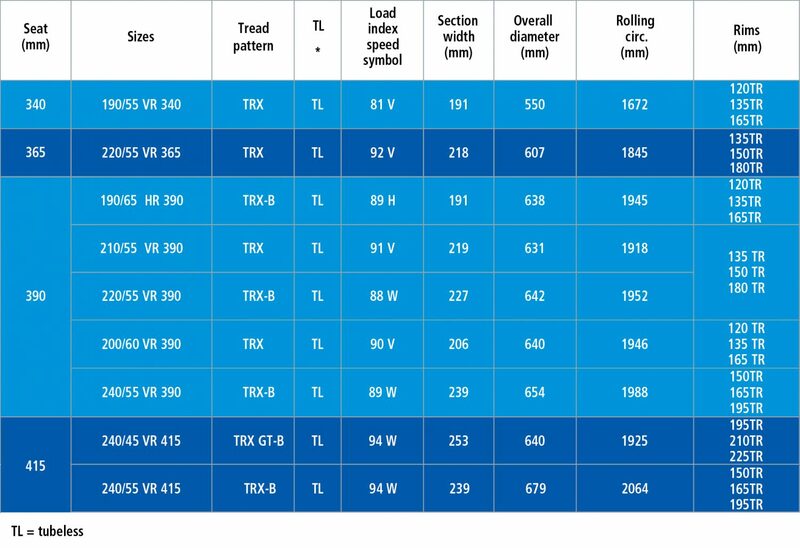 Being a VR category tyre, the XWX can be used at speeds in excess of 20 kph (13 mph); with a maximum speed of 270 kph (155 to 186 mph). At the end of the 60’s, Germany and Italy were the leaders in the European motorway development programme. They were also the main producers of cars which could reach speed in excess of 200 km/h (124 mph). The wide asphalt strips and the absence of speed limits offered a privileged few the opportunity to make full use of the performance of these “super-cars” at speeds which would be unthinkable today. The Lamborghihi Miura (1966), Ferrari 365 (195), Maserati Ghibli (1966); de Tomaso Pantera (1970) and Porsche 911 Carrera RS (1972) were the undisputed stars, but the large German saloons like the Mercedes 300 SE 6,31 (1931) and BMW 3.0 SI (1971) also made a strong impression. The French were also in the frame with the Citroen MS (1970) as were the British with the legendary Jaguar V12 E-Tyre (1970) and Aston Martin DBS (1967). Informed observers will note that this exceptional performance was achieved on tyres of the same width as those that fit today’s very sensible saloons. The invention of the TRX by Michelin in 1975 permitted a more even distribution of tension in the whole tyre casing, which is where the name of TR standing for “Tension Repartie” (“distributed tension”) comes from. The TRX won renown in Formula 1 racing with Renault and Prost and in the world rally championship on the Audi Quattro, 205 Turbo 16 and R5 Turbo. For the first time, the tyre and its rim complemented one another perfectly, working as a single unit. The rim underwent a fundamental transformation, the essential characteristic of which was a flatter, lower flange. This new design of the rim and tyre bead resulted in a gradual curvature of the casing, without the “S” shaped flexing inherent in traditional designs. The 70’s saw the dawn of increased awareness of the importance of vehicle safety. In many countries it became compulsory to wear seat belts and speed limits were introduced on main roads and motorways. For the tyre, this led to improvements in grip, more precise steering, increased stability and better levels of comfort, thus avoiding excessive driver fatigue on long journeys. All these cars (and many others) had the Michelin TRX fitted as original equipment, and still can today, with a tyre true to that era, but manufactured using today’s techniques and materials. Is a new stage in the development of radial technique: the casing and the rim are designed together and adapted to the specific needs of the vehicle. This tyre reconciles two mutually exclusive qualities: greater comfort (formerly the prerogative of the high, supple sidewalls) and more responsive handling (formerly the prerogative of the low, rigid sidewalls).